Pituitary surgical specimens are frequently submitted for intraoperative consultation (i.e., frozen section) and thus, are one of the most common neurosurgical specimens that may be encountered by general surgical pathologists. More than 90 % of these cases are pituitary adenomas, and the frozen section diagnosis is usually straightforward. However, challenging cases requiring differential diagnosis among a pituitary adenoma vs. hyperplasia vs. normal adenohypophysis, as well as unusual sellar/suprasellar tumors other than pituitary adenomas, are sometimes encountered during intraoperative consultation. 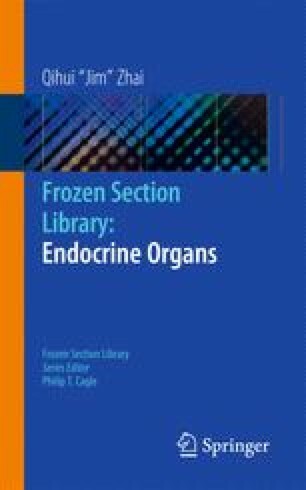 This chapter addresses most tumors of the pituitary gland that are listed in the 2004 WHO classification of Tumors of Endocrine Organs, and other pituitary tumors that are relatively frequently seen in a daily surgical pathology practice are described. Since cytologic smears play a critical role in making a frozen section diagnosis, as with other neurosurgical specimens, cytological features of touch imprints are also emphasized.